The 2018 model will serve that same stiff single piece purpose but with an upgraded end cap design and some new alloy additives to create more durability and a nice balanced swing. It will remain, we submit, a favorite bat of many strong high school and college players. We aren’t the only ones to have information about the 518 Omaha. Other places, in particular those who sell bats, usually have a boiler plate write up on the specs of a bat. Many of those we reference to make sure we are seeing what we should be. Here are some more references for the 2018 Louisville Slugger 518 Omaha review. It is no secret that different types of hitters also tend to like different types of bats. 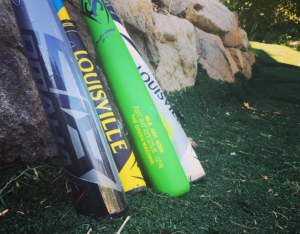 In its current form, the Omaha series from Slugger has served the need of a value purchase in the younger leagues and the best bat for big hitting college players. Single piece bats transfer the most power to the ball and, accordingly, the most buzz to your hands. For 2018, the inaugural USA Bat year, the 518 did remarkable. It served as an entry level bat with good durability and sustainable pop. Parents weren’t concerned about dropping several hundred bucks on a bat that broke or had legality issues. The 518, in its range of drops and lengths was a real smash in the 2018 USA Bat space. It stands as a super smart buy. In the youth and big barrel space, the 518 serves as one of our favorite value purchases. Although it can ring the hands with it’s single piece design, the bats good brand name, decent sized sweet spot and lighter swing are made for the budget conscience buyer looking for a good, new, stick. The most signficant upgrade from the 2017 Omaha to the 2018 Omaha is the change in the end cap. End caps, often overlooked, deliver good perofmrnace through the end of the barrel as well as increase durability. Also, end caps play a significant roll in swing weight. As, without surprise, weight added to the end of a bat effects swing weight more than any other factor. Slugger's new 518 6-point end cap enhances the bats balance point and increases durability. It theory, at least, it extends the sweet spot too. We are not foaming at the mouth convinced this is a true upgrade in terms of performance. But, if both the 517 and 518 were the same price we would prefer the 518 for this reason alone. How much someone should pay for the improved end cap will be a personal decision. From the 2016 516 to the 2017 517 the alloy on the Omaha went through a considerable upgrade. That alloy allowed for a larger barrel without hurting durability or an increase in swing weight. That same alloy (Slugger calls this the 7U1+ alloy) is found in the 518 Omaha too. There are several single piece aluminum bats on the market today. In terms of structure, the most similar, or at least one of them, is the DeMarini Voodoo One. Both of these bats have very similar swing weights, are made for the stiff feel and good power transfer. As well, both come in a number of sizing options. And both are aluminum bats built with the same price point and market in mind. In accordance with the way Easton did things last year Slugger is also putting a swing weight index on their bats. This allows a player to get a numerical representation of how the top end of Slugger bats swing compared to one another. The 518 Omaha is the 2nd heaviest baseball bat Slugger makes. It is noticeably heavier than the 618 Solo and lighter than the 718 Select. Although technically heavier than the 918 Prime, it is difficult to tell the difference in MOI when comparing the two. You can see many of the swing weights for BBCOR here. As we mention above, the major difference between the 2017 517 Omaha and the 2018 518 Omaha is the use of a different end cap. the 2018 version uses an newer composite that allows for a better sweet spot towards the end cap and a little more durability. Ultimately, however, the 517 was a really great single piece aluminum bat. And the idea that an end cap somehow changed the nature of the beast is silliness. The 518 is the very close relative of the 517 and we’d struggle to suggest, with a straight face, the bats are different. Below are the list of sizes the Louisville Slugger 918 Prime bat will be offered in. There may be more than these.